Ankle rehab programs should focus on specific ankle rehab exercises in order to be effective. Regaining range of motion is an important part of this process. It is one of the first things that your ankle rehab program should focus on. Whether your physician refers you for therapy, or you are left to go it alone at home, these guidelines will help you make sure that your ankle rehab program is on the right track. Tthat means you will get better faster, and be less likely to have a recurrent ankle sprain. Passive range of motion means that something is moving your ankle for you...there is no muscle contraction. You could also call this stretching, however, with limited motion, you won't really be stretching the muscles, but rather moving against swelling and other restrictions. The simplest way to do these exercises is to use your hands and move your ankle gently in all different directions. Or, you can have a partner move your ankle for you. These exercises are good to start with, but you should be able to move to active motion exercises fairly quickly, usually a few days after injury. After an ankle sprain, your ankle is going to be very swollen. Depending on the severity of the injury, as well as how your body reacts, will determine how much swelling you have. Make sure you follow the RICE Principles to treat your swelling during the first few hours after injury. After the first 3 days, you can start working on improving your range of motion. There are lots of different ankle rehab exercises that can help you gain motion in your ankle. The simplest are exercises like pointing your toes, pulling your foot towards your body, turning your foot in, and turning your foot out. Once you can do these things, then you can start combining motions with exercises like making circles and writing the alphabet. Once you can easily move your ankle in all directions without pain, you are ready to start working on functional range of motion. 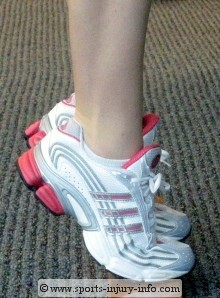 Functional range of motion is the motion that is used when you are bearing weight on your ankle. Often you can move your ankle pain free sitting on the table, but then when you put weight on it you aren't able to move it as far, or it is painful. To improve functional motion, you first have to start with simple exercises like weight shifting. Shifting your weight from side to side, placing as much weight as you can on your injured ankle will start to get the joints used to bearing weight. After you master weight shifting, you can begin to work on squatting, lunging, and stepping. All of these simple ankle rehab exercises will help to improve your functional motion. What If It Is Stuck? Sometimes after an ankle sprain, you are not able to restore normal motion completely, despite doing all of the right exercises. Depending on the severity of your injury, you may have some restrictions in the joint capsule or ligaments that are healing. Several weeks after your injury you may notice that your ankle just doesn't move as much as the other one. This is very common. 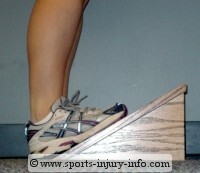 Restrictions like this need to be treated by an athletic trainer or physical therapist because they require joint mobilization techniques in order to restore the normal motion. For a complete program to treat your ankle sprain and ankle pain, you not only need to regain your motion, but strengthening, balance, and endurance exercises as well. I offer all of these in a comprehensive ankle rehabilitation program called Ankle Sprain Solutions. If you are suffering from ankle pain or a sprained ankle, this is the program for you. It will walk you step by step through the BEST ankle rehab exercises to treat your ankle pain. Don't underestimate your ankle sprain - it could end up causing more problems than you can imagine. Restoring your range of motion with ankle rehab exercises is very important during the early stages of ankle rehabilitation. Start with passive motions, then progress to active and functional motion exercises. Remember, you need to have normal range of motion before you can start aggressive strengthening, or returning to play. If you run into trouble, or can't get your motion completely back, don't be afraid to talk to your doctor and ask for a referral to a sports medicine clinic.